It’s taken over a week to get over jet lag, get with the miserable British weather and get cooking Indian. Hubby is only back today and this whole being alone without him thing brought back a way of living I thought I left behind for good. I’ve been out and about, meeting friends for dinners and going to the gym. Home cooked food has mainly consisted of tossed salads and antipasti. Designed as much to be fuss free as low fat. When a friend came over for dinner, I jumped at the chance of trying my hand at parathas. What’s a few mis-shapen flatbreads between two good friends. (I made rice just in case anyway). Parathas can be made with either plain white flour or wholewheat flour. They are cooked with oil though, unlike rotis. This time I tried my hand at ajwain parathas. Nani, my bossy maternal gran, made these for us in India. The ajwain gives these otherwise fairly average parathas a slight pungent kick. I’ve figured that rotis and parathas are only worth the effort when they are the focus of the meal and made in small quantities. 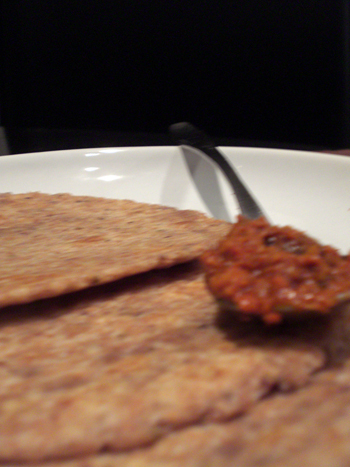 I made some kali dal in the pressure cooker and we devoured it all with mango pickle and a few vodkas. Fabulous. Shame there weren’t any left for our split second breakfast before we hit the shops for some serious card bashing. Hubby is back today. Just in time. Line the worksurface and floor with old newspaper. In a large mixing bowl, add the flour, the ghee, salt and ajwain seeds. Add two teaspoons of hot water and mix it into the flour vigorously, incorporating lots of air into the flour. Keep doing this until you get a hard dough that uses all the flour and isn’t sticky. Now go in with knuckles and knead. First one way, then the other. I counted 10 times before I got bored. Shape the dough into a thick sausage and shape into six balls. Leave them in the mixing bowl, covered with a damp cloth for half an hour. Heat a teaspoon of oil in a heavy bottomed frying. The heat should be a strong simmer. Lightly flour a flat surface and roll one of the dough balls out into a round shape. You do this by rolling out one side, turning gently clockwise/counter clockwise and repeating until an even round shape appears. Then you lay it flat on the oil in the pan. When the side facing the oil gets brown spots on it, flip it over and add another teaspoon of oil to the base. It will sizzle all around and underneath the paratha. The paratha is done when little brown spots appear on both sides and you can fold it with your flat spoon. Now just repeat the process with the other five. I kept them wrapped in a napkin while I was making them so they stayed warm and pliable. Throw the newspapers when done and enjoy the parathas warm. Misshapen!! Looks great to me! Good to hear that hubby is back. They sound good.Enjoy and take care. I think we seem to be on the same food schedule. I made fenugreek (methi) parathas late last week, and methi aloo subji when you made your methi dish. Odd, but great to hear about your paratha success. Mine didn’t turn out as well and my tava is ruined. sad…. did u have a look at this list? misshapen.. I do it all the time. Here it’s fine.. one time I tried to pass them off in India and my parents were horrified 😉 your parathas look delicious. Good to hear that your hubby is back, sorry to hear about your mother-in-law. You are in our thoughts. 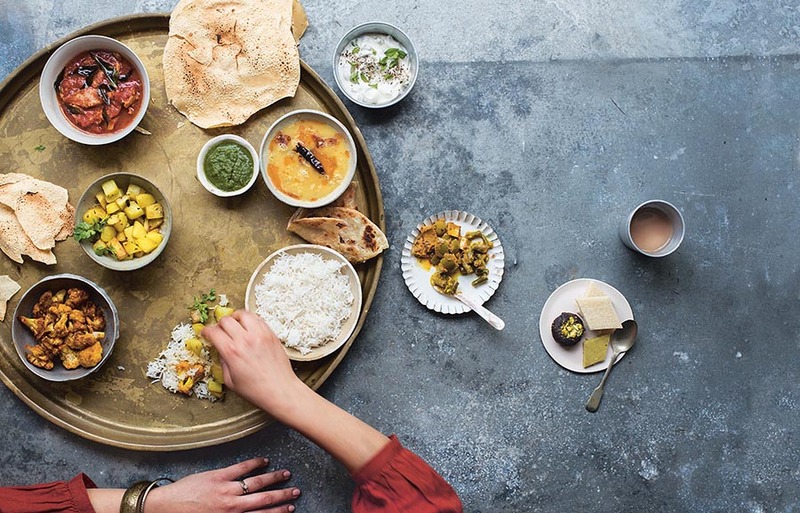 mallika, looks like u r rocking and rolling… parathas look really good and it does sound gr8 with ajwain in it..
Oh my…what a wonderful blog dedicated entirely on Indian cuisine…..I love Indian food very very much. Use to eat it at least twice a week in Malaysia lol! As Editor of http://www..dadinani.com, we have now begun collecting 1-3 authentic dadi-nani recipes. Please see http://www.dadinani.com/capture-memories/read-contributions/dadi-nani-recipes for the first one. We are also collecting our memories of our grndmothers, and we would love to get contributions from your readers. I’d love to see some guest posts fom you for http://www.mypiggywiggy.con please contact me.